A part of Thermo Fisher's Pharma Services Group, Patheon is a North Carolina-based contract development and manufacturing organisation (CDMO) that has invested US$26 million to update a sterile pharmaceutical development services (PDS) suite and to build a fully-integrated sterile PDS suite at its site in Greenville, North Carolina. 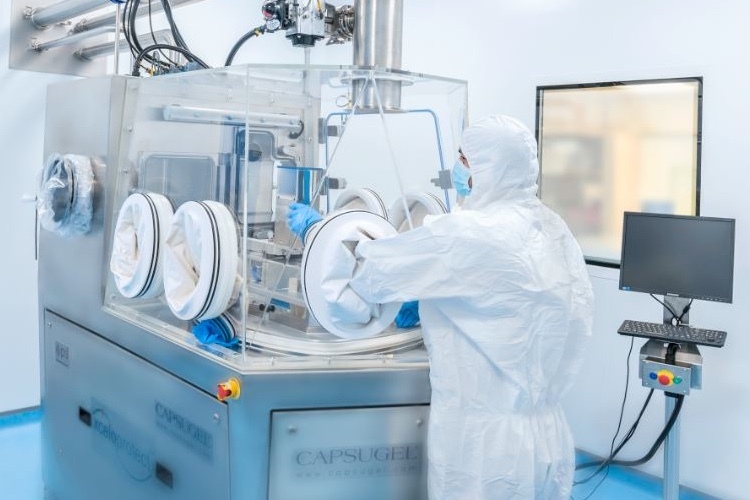 At its large, multi-purpose pharmaceutical manufacturing and packaging campus in Greenville, Patheon is also investing in facilities that will expand its packaging and serialisation capabilities. It will also add a continuous manufacturing suite and new stability storage to support the company’s North American facilities. 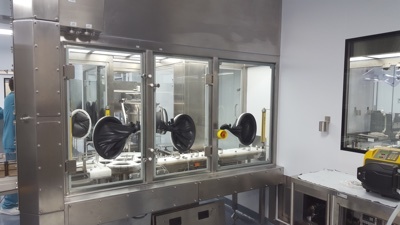 Patheon has designed the updated PDS facilities to provide 7,000 ft2 of GMP steriles manufacturing space, compliant with regulatory authority requirements. 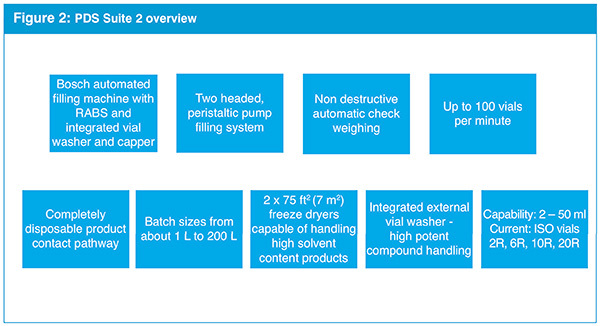 It will manufacture sterile liquid and lyophilised drug products in the newly-built PDS facility, which is fitted out with freeze dryers and a fully-integrated filling line with a restricted access barrier system (RABS) for sterile drug products. The RABS offers flexibility in turnaround time, while maintaining a high level of containment and separation from the environment (see Fig.1). 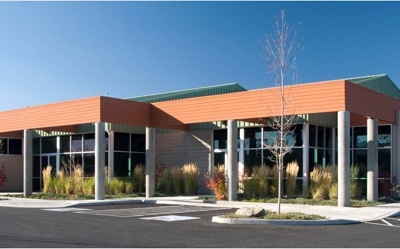 The new facility was designed by leveraging network resources from Patheon’s corporate engineering experts and other global facilities, particularly the company’s manufacturing site in Ferentino, Italy, which also has a PDS suite for investigational medical products. that best accommodate client and industry demands. The Greenville site also offers two manufacturing suites in the new PDS area that operate with a 100% disposable product pathway. 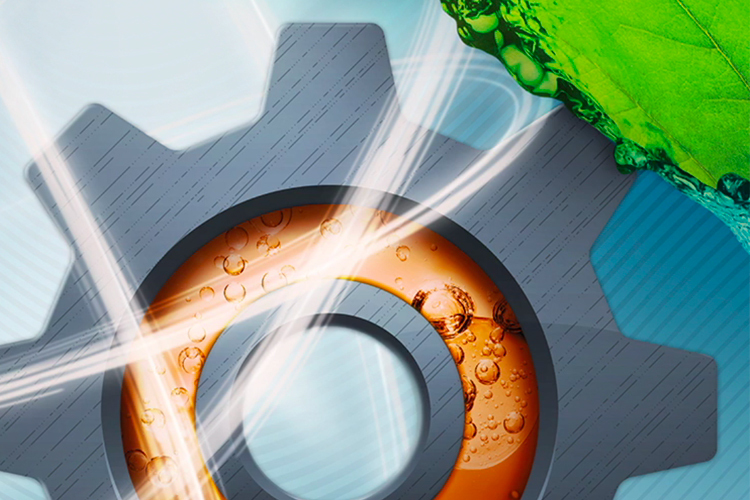 The investment in disposable manufacturing eliminates the need for cleaning verification for liquid filling, and reduces set-up time and product losses. This enhances sterility assurance and also accelerates speed to clinic and improves cost-effectiveness. 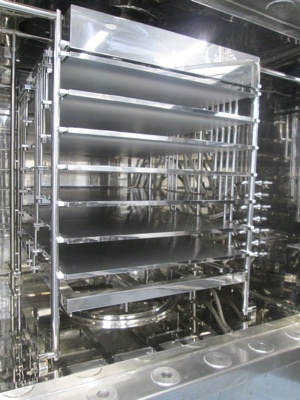 The facility is designed for products at all stages in the life cycle, from clinical development, to scale-up of much larger batch sizes, via Patheon’s network of commercial scale capabilities. 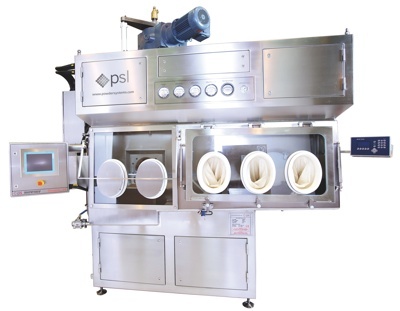 Because one of the PDS suites will be used for small-scale commercial production and development, during the design process, drawings of the changes were submitted to the US Food and Drug Administration (FDA) for pre-approval. The facility can handle a wide range of batch sizes, from less than one litre to 200 litres and, as with Patheon’s Ferentino location, is expected to handle a diverse set of products and processes. The main focus is on qualified International Organisation for Standardisation (ISO) standard vials 2R, 6R, 10R and 20R for both liquid and lyophilised product pathways. 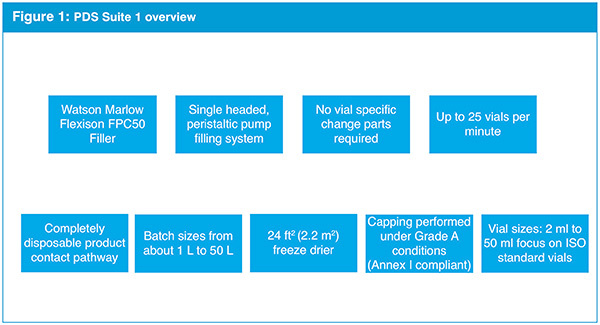 However, the facility is capable of producing a 50R vial if needed (see Fig. 2). 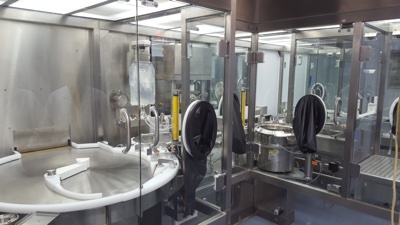 Since Patheon’s clients often need development and manufacturing capabilities for high potency active pharmaceutical ingredients (HPAPIs), the facility was designed to accommodate HPAPIs, with containment in both the cleanroom and on the manufacturing line, and an external vial washer in place to clean external surfaces at the end of the manufacturing process so that vials can be safely handled. Within the Greenville facility, Patheon can take on development projects from a preclinical stage through to the manufacture of clinical trial material (for all stages of development). It can then scale-up to a commercial line, optimising and executing large batches for product launches. Patheon’s API and biologic sister sites in Brisbane, Australia, Princeton, NJ, St. Louis and Groningen, Netherlands, offer a full range of development and manufacturing services to clients of all sizes. 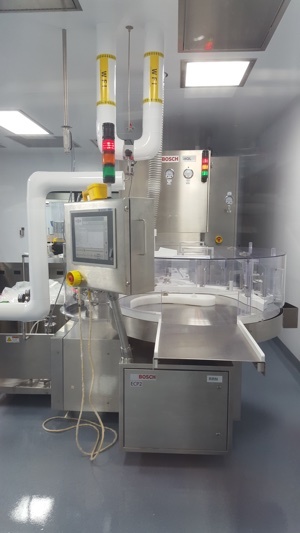 As part of its expanded packaging and serialisation capabilities in Greenville, Patheon built a new filling and packaging suite, and upgraded another of its packaging lines with new technology, to improve efficiency and reduce change-over time. The newly-built 4,800 ft2 suite, expected to come online in autumn 2017, features a filling and packaging line equipped with an Optel serialisation system. 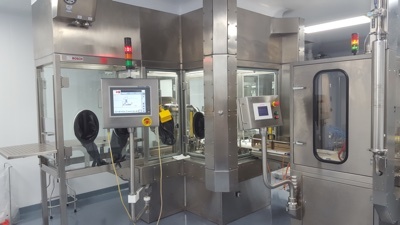 The system includes cameras, pharma proof stations, a line master, and bottle and bundle tracker equipment to help Patheon meet growing client demand for flexibility in manufacturing and packaging solutions. The humidity controlled fill room is equipped with a Cremer filler with a cyclone dust collection system and diverting conveyor, which allows for increased speed at the end of the fill line. As a global service provider, the investment in packaging and serialisation capabilities is part of Patheon’s response to varying regulatory conditions in different countries, including early adopters, such as Turkey, South Korea and China, where serialisation is already required. In the US, there is a November 2017 deadline for complying with the Drug Supply Chain Security Act (DSCSA), which was enacted by Congress to create an electronic system for detecting and tracing the distribution of medicines in an attempt to protect patients from counterfeit, stolen or contaminated products. Clients across the pharma industry may each have a slightly different interpretation of what the DSCSA demands, requiring Patheon to work closely with each client to ensure compliance with both current and future serialisation regulations. Over the next few years, the implementation of serialisation requirements will prove more than just a matter of compliance, the process will prove a valuable source for gleaning insights and information into commercial channels. Serialisation will enhance clients’ ability to track distribution channels and the location of specific packages, ensuring improved inventory management, field recalls and sales data, while also giving the pharma industry the ability to combat counterfeit products. As the drug development and delivery solutions sector continues to innovate, drug companies will increasingly seek CDMO partners with the expertise, customised solutions and technical capabilities to support production of their small- and large-molecule products. Through the recent upgrades in Greenville to other current and future investments across Patheon’s global network, the company plans to meet – and exceed – client needs, including the launch of new products and the packaging and serialisation of these products.